It’s always fun to swing a stick and hit something. Especially when the reward for such violence is some sweet sugary candy. And hey, we all have a grudge against the Empire right? Why not work out your frustrations on this TIE Fighter Pinata? If I could hit this thing right now I would be thinking about how there was almost nothing neat or cool in the Star Wars prequels. I would be thinking about Jar Jar Binks. My focused rage for Jar Jar alone would be enough to send candy flying everywhere with one whack. I would be wondering why this Tie Fighter is a shade of Easter blue. But I digress. This handcrafted pinata measures about 14 x 12 x 15 inches and features an easy open flap to put your favorite candy inside. It comes from Etsy seller Outofthisworldpinata who makes all kinds of geek pinatas. There’s also a Millenium Falcon pinata available, but sadly that one just looks like a flattened cake. 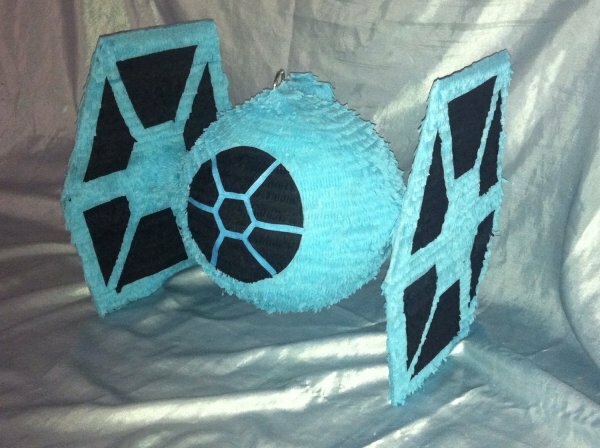 The TIE Fighter pinata is great for geek birthdays or whenever you want to wage a one man war against a lone Imperial craft. You can buy one for $45(USD) from the seller here.